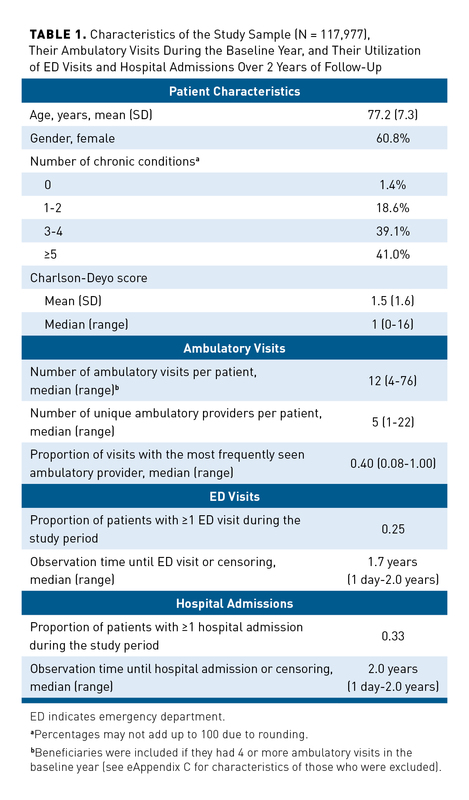 Thus, we sought to determine the associations between care fragmentation in the ambulatory setting and subsequent ED visits and hospital admissions, while considering whether those associations vary with number of chronic conditions. We conducted a cohort study (2010-2012) of fee-for-service (FFS) Medicare beneficiaries who received care from physicians in the Hudson Valley of New York to determine associations between fragmented ambulatory care and subsequent ED visits and hospital admissions. The Institutional Review Board of Weill Cornell Medicine approved the protocol. We used Medicare FFS claims data for 2010-2012, extracting the following claim-level variables: patient study identifier (ID), patient date of birth, patient gender, date of service, rendering provider ID, Current Procedural Terminology (CPT) codes, and International Classification of Diseases, Ninth Revision (ICD-9) codes. We also extracted monthly patient-level enrollment data. We first identified primary care physicians (general internists and family medicine physicians) in the claims who had billing zip codes in the Hudson Valley (Figure). We determined which Medicare beneficiaries 65 years and older could be attributed to those primary care physicians, based on 2010 claims, using previously defined logic.13 Of those, we identified beneficiaries who were continuously enrolled that year and had 1 or more ambulatory visits. Ambulatory visits were defined by CPT codes, using a modified version of the definition by the National Committee for Quality Assurance (NCQA).14 Modifications restricted the definition to evaluation-and-management visits for adults in an office setting, excluding management-only visits (eg, physical therapy) and non–office-based visits (eg, visits in nursing homes). This definition also excluded ED visits. We excluded beneficiaries with outlier observations (>99.9th percentile) for number of ambulatory visits or unique providers, because those observations may have been erroneous. Next, we restricted the cohort to those with 4 or more ambulatory visits in the baseline year, because calculating fragmentation with 3 or fewer ambulatory visits can lead to statistically unstable estimates.8 We required that beneficiaries be continuously enrolled in Medicare for at least 1 more consecutive year, contributing data for 2 years (2010-2011) or 3 years (2010-2012). Finally, we excluded those who were in the hospital on January 1, 2011, because they were not at risk of an ED visit or hospital admission at the start of follow-up. Dependent variables. We identified ED visits and hospital admissions in the claims, using definitions from NCQA.14 An “ED visit” resulted in discharge to home or elsewhere. If an ED visit resulted in hospital admission, it was considered part of that admission and counted only as an admission. Potential confounders. We used ICD-9 codes to calculate the number of chronic conditions for each beneficiary (0, 1-2, 3-4, or ≥5)3 of 26 unique chronic conditions defined by CMS (eAppendix B).17 We also calculated a severity of illness index.18,19 We considered beneficiary age and gender as potential confounders. In addition, we considered the number of ambulatory visits as a potential confounder, because the number of ambulatory visits was weakly correlated with fragmentation score (Spearman correlation coefficient, 0.22; P <.0001). Descriptive statistics. We characterized beneficiaries in terms of age, gender, and number of chronic conditions. We compared the characteristics of the study sample with those who were excluded using pairwise Wilcoxon rank-sum tests for continuous variables and χ2 tests for categorical variables. For the study sample, we calculated descriptive statistics regarding the number of ambulatory visits, number of unique providers, and proportion of ambulatory visits with the most frequently seen provider in the baseline year (overall and stratified by fragmentation quintile). We also determined the proportions of beneficiaries who had 1 or more ED visits and, separately, 1 or more hospital admissions during follow-up. Statistical models. Because fragmentation can change over time and because the hypothesized consequences of fragmented care may unfold relatively quickly, we used Cox models and treated fragmentation as time-dependent. That is, we first calculated fragmentation in the first 12 months (calendar year 2010) and determined whether the beneficiary had an ED visit in month 13 (January 2011) or not. We then moved this window of observation by 1 month, recalculating the model using fragmentation in months 2 to 13 as a potential predictor of an ED visit in month 14, and so on. 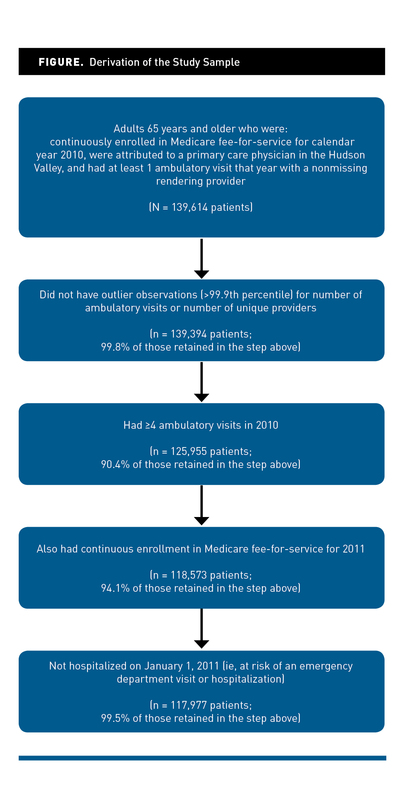 If the number of ambulatory visits in any 12-month window fell below 4 (making it difficult to calculate fragmentation scores), we carried forward the last fragmentation score that was based on 4 or more ambulatory visits. We used the same approach in separate models predicting hospital admissions. For each model, observation continued until an outcome or censoring occurred. For the ED visit models, censoring occurred (1) if a beneficiary was admitted to the hospital (with the reasoning that the beneficiary was not at risk of an ED visit) or (2) at the end of the beneficiary’s continuous enrollment. For the hospital admission models, censoring occurred only at the end of the beneficiary’s continuous enrollment; any ED visit had no effect on the hospital models, because the beneficiary was still at risk of a hospital admission. We adjusted for beneficiary gender and for the following time-varying covariates: age, Charlson-Deyo score, and number of ambulatory visits. By adjusting for number of ambulatory visits, we sought to fully tease apart fragmentation (the diffuseness of care) from the volume of ambulatory visits, as we have done previously.3 We calculated an interaction term for fragmentation category*chronic condition count and then, because this term was statistically significant for at least 1 model, we stratified our analyses by chronic condition count. We considered P values <.05 to be statistically significant. We used SAS version 9.4 (SAS Institute; Cary, North Carolina). Our sample was composed of the 117,977 (85%) beneficiaries who did not have outlier observations, had 4 or more ambulatory visits, had continuous enrollment for at least 1 more consecutive year, and were not hospitalized on the first day of 2011 (Figure). Among the 117,977 beneficiaries in our sample, the mean age was 77.2 years (Table 1). More than half (60.8%) were women. The distribution of counts of chronic conditions was as follows: 1.4% had 0 chronic conditions, 18.6% had 1 to 2 chronic conditions, 39.1% had 3 to 4, and 41.0% had 5 or more. Most beneficiaries (93%) contributed data for all 3 years of the study, whereas the remainder (7%) contributed data for the first 2 years only. The 13,439 beneficiaries (10% of the total) who were excluded because they had 3 or fewer ambulatory visits were younger and healthier than those who were included (eAppendix C). The 7978 beneficiaries (6% of the total) who were excluded because they were not continuously enrolled in 2011 (including due to death that year) or were hospitalized on January 1, 2011, were older, less likely to be female, and sicker than those who were included (eAppendix C). Among those who were included, the typical (median) beneficiary had 12 ambulatory visits with 5 unique providers in the baseline year (Table 1). The typical beneficiary also had 40% of ambulatory visits with their most frequently seen provider. As the proportion of visits with the most frequently seen provider decreased, fragmentation increased (Table 2). Just 2.5% of the sample had 1 provider for all visits (resulting in a fragmentation score equal to 0.00). One-fourth of beneficiaries (25%) had 1 or more ED visits during follow-up. The median observation time until an ED visit or censoring (for the ED visit models) was 1.7 years. One-third of beneficiaries (33%) had 1 or more hospital admissions during follow-up. The median observation time until a hospital admission or censoring was 2.0 years. Schoenfeld residuals and zph tests showed that our models did not violate the underlying statistical assumptions. Among those with 0 chronic conditions, having fragmented care did not increase the hazard of an ED visit (Table 3). Among those with 1 or more chronic conditions, having the most (vs the least) fragmented care significantly increased the hazard of an ED visit, by a magnitude of 13% for those with 1 to 2 chronic conditions (P <.01), 14% for those with 3 to 4 chronic conditions (P <.0001), and 10% for those with 5 or more chronic conditions (P = .001). Some but not all of the intermediate fragmentation categories were also associated with an increased hazard of an ED visit. 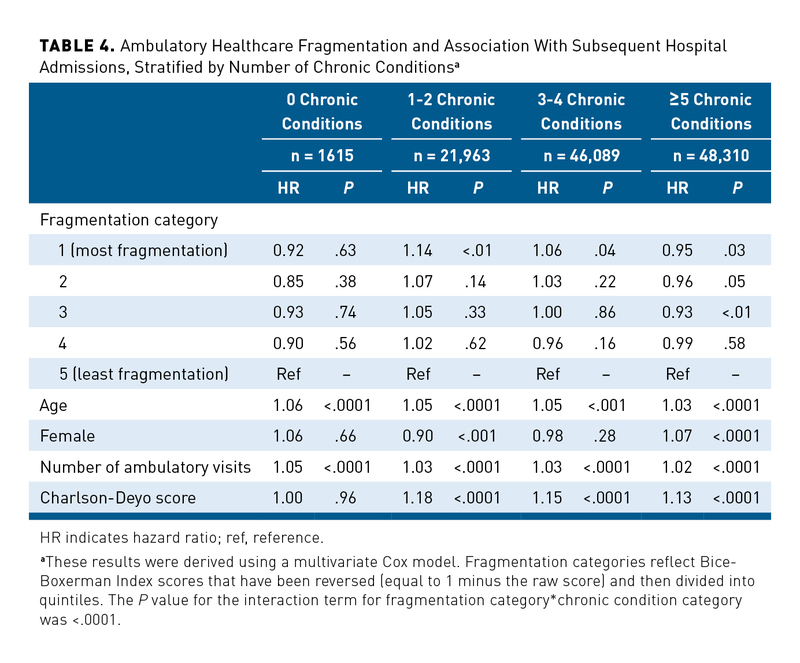 Among those with 0 chronic conditions, having fragmented care did not increase the hazard of a hospital admission (Table 4). Among those with 1 to 2 or 3 to 4 chronic conditions, having the most (vs the least) fragmented care significantly increased the hazard of a hospital admission, by a magnitude of 14% for those with 1 or 2 chronic conditions (P <.01) and 6% for those with 3 or 4 chronic conditions (P <.05). Among those with 5 or more chronic conditions, having the most fragmented care decreased the adjusted hazard of a hospital admission by 5% (P = .03). Most intermediate fragmentation categories were not associated with a significant difference in the hazard of admission. Sensitivity analyses using 2 alternative fragmentation indices (eAppendices D and E) showed results consistent with our base-case analyses, both for ED visits and hospital admissions. In this study of Medicare FFS beneficiaries 65 years and older, having highly fragmented care (in the highest quintile of fragmentation scores) seemed to have the greatest impact on subsequent outcomes, suggesting a potential threshold effect. Those with highly fragmented care had a median of 13 ambulatory visits with 8 providers, and their most frequently seen provider typically accounted for just 24% of ambulatory visits. The relationship between highly fragmented care and subsequent outcomes varied by the number of chronic conditions. Among those with 1 to 2 or 3 to 4 chronic conditions, having the most (vs the least) fragmented care significantly increased the hazard of an ED visit and, separately, increased the hazard of a hospital admission (P <.05 for each comparison). Among those with 5 or more chronic conditions, having the most (vs the least) fragmented care significantly increased the hazard of an ED visit but decreased the hazard of a hospital admission (P <.05 for each comparison). This observation could mean that having many providers for these complex patients is often necessary and sometimes protective. 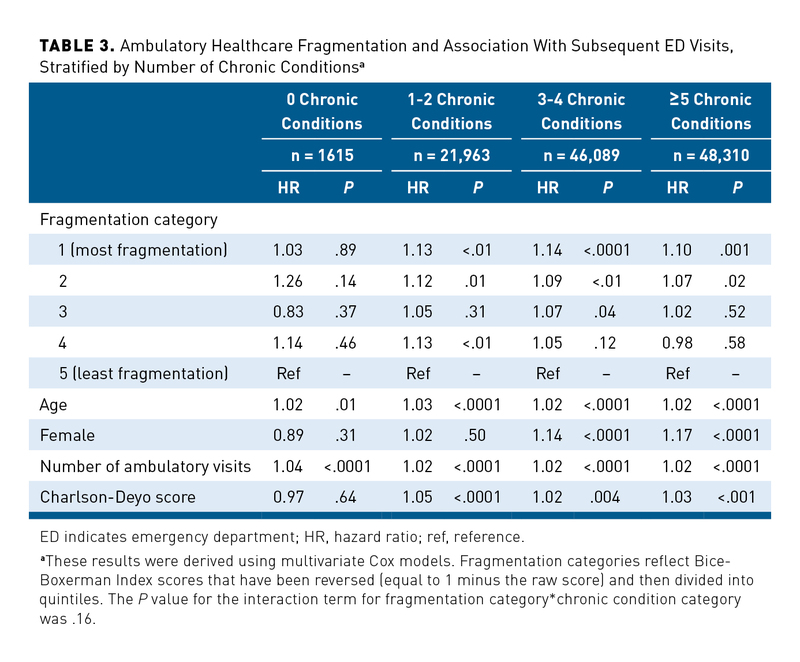 We did not find an association between fragmentation and ED visits or hospital admissions among those with 0 chronic conditions, perhaps because those who are relatively healthy are not as vulnerable to the adverse effects of fragmented care. Our finding of an increased hazard of ED visits for those with fragmented care and at least 1 chronic condition is consistent with findings from 2 other studies, which were disease-specific: 1 that focused on patients with diabetes7 and another that focused on patients with diabetes, congestive heart failure, or chronic obstructive pulmonary disease.6 Our finding of an increased hazard of hospital admissions for those with fragmented care and 1 to 4 chronic conditions is also consistent with studies that expressed the increased hazard as a function of a 0.1-point increase on a continuous fragmentation scale.6,8 Thus, our work expands the literature by including Medicare beneficiaries regardless of disease type and by quantifying the magnitude of the hazard for the most fragmented care. The results have implications for the design of future interventions to improve healthcare, in terms of which patients to target for intervention. Many previous efforts to improve healthcare quality and efficiency have targeted the sickest patients,24,25 which makes sense, because these patients account for a disproportionate amount of healthcare utilization.26 However, the effectiveness of these programs has been mixed,24,27 perhaps in part because it is difficult to modify the need for care among the sickest patients. Our study findings suggest that there may be inefficient utilization of healthcare services among those with a moderate number of chronic conditions. Inefficient utilization may be modifiable, and decreasing inefficiency among the many people with a moderate disease burden may have a large aggregate impact. This study has several limitations. First, it is observational, and we cannot rule out unmeasured confounding. Second, we cannot draw conclusions about the medical appropriateness of the care patterns observed. It is possible that fragmentation increases appropriately when patients become acutely ill and that this appropriate use of multiple providers occurs just prior to an ED visit or hospital admission. Future studies with more granular clinical data are needed to help clarify issues of appropriateness. Third, we did not measure communication across physicians. Although having fragmented care may increase the risk of gaps in communication across providers, its presence should not be interpreted as a definite lack of care coordination. Fourth, we did not have data on practice characteristics or practice affiliation, so we were not able to account for those. Fifth, this study took place in 1 region, which may limit generalizability; however, this region is a multipayer, multiprovider healthcare market, which may make it similar to other communities. Future studies could include market characteristics (such as rural vs urban and number of providers per population) as additional explanatory variables. Sixth, this study included only FFS Medicare beneficiaries; results may not apply to patients with other insurance types. Highly fragmented care can independently increase the hazard of an ED visit or hospital admission, even among those with a moderate number of chronic conditions. Reducing fragmentation for those with a moderate number of chronic conditions may both improve quality and reduce costs. This study was funded by the Commonwealth Fund (grant #20140960). The authors thank Leah Hellerstein, BA, and Yesenia Miranda, BA, for their assistance with reviewing the literature. The authors thank the New York State Department of Health for facilitating access to the data. The conclusions do not necessarily reflect the views of the Commonwealth Fund or New York State Department of Health.